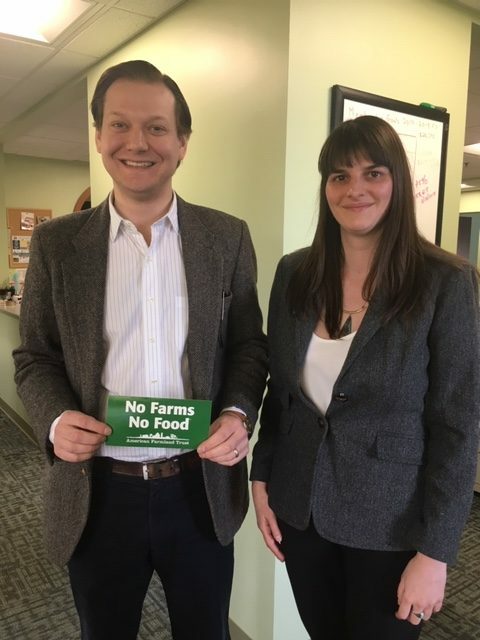 Working Lands Alliance wants to publicly congratulate our friend and colleague Bryan Hurlburt on his appointment to be the Connecticut Department of Agriculture’s commissioner. Bryan brings a breadth of experience to the position and deeply cares about farmers across the state. He is a former democratic state legislator, the previous FSA director appointed by Barack Obama, former Wholesome Wave employee, and most recently the executive director of the Connecticut Farm Bureau Association. While Bryan was in the state legislature, Working Lands Alliance acknowledged Bryan with a Legislative Appreciation Award in both 2010 and 2011. During the 2010 legislative session, Bryan worked tireless with Senator Williams, Representative Chapin, and several others to pass important legislation creating a dairy support payment program. The following year, Bryan once again deserved recognition for his leadership in the Farms, Food and Jobs Bill. WLA brought to Bryan this positive, feel-good bill that would remove some policy obstacles to local farm businesses, with broad support from the agriculture community and almost no fiscal note. He immediately embraced the concept and worked diligently during session to shepherd the bill through multiple committees and made every effort to work constructively with the bill’s few opponents. That sort of ownership and caretaking of a single bill is not always easy to find in the General Assembly. Bryan continued his great work when he left the state legislature to oversee FSA. When former President Obama left office in early 2017, Bryan took a position with Wholesome Wave in Bridgeport. Wholesome Wave creates partnership-based programs in underserved and socially disadvantaged communities across the country. Here, Bryan worked to oversee some of the organization’s largest grant programs including the Double Value Coupon Program and the Fruit and Vegetable Prescription Program which are funded through USDA’s Farmers Market and Local Food Promotion Program. These programs are critical for individuals who rely on public assistance programs and live in areas where access to healthy affordable food options are limited. In July, Bryan became to the executive director of the Connecticut Farm Bureau Association and continued his work as an advocate for farmers and farmland in the state. WLA’s Steering Committee was thrilled when Bryan was hired to oversee Farm Bureau and it has been a true pleasure to work with Bryan during his time there. While there, Bryan was a lead advocate in helping the state pass legislation that would create a USDA approved hemp program. If passed, Connecticut will be the 43rd state to implement this program that will open doors for farmers who are looking to diversify and for the economic viability of agriculture in the state.